One of my first decisions with my class blogging project was which blogging platform to use. My first choice was Blogger, because I have seen it used successfully for student blogs in NZ and overseas, and it is the blogging platform that I use for this blog. Because of this I am confident with its features and how to use it effectively and so wouldn't be starting as a beginner. I also found a number of useful resources on the internet about how to set up blogging with students using Blogger, such as this set-up guide from Rachel Boyd. My reasons for deciding against it were primarily because as a teacher starting out with class blogging, and with students unfamiliar with the blogging process, I wanted maximum control over what ended up online. I also wanted an option that reassured parents of their children's safety and which allowed me to give effective feedback. 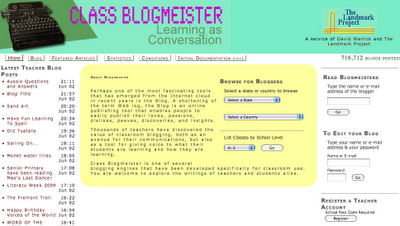 Using Classblogmeister is like blogging with training wheels on at first, which is exactly what I wanted for my class. First, it's not blocked. Next, it offers TOTAL teacher approval before any student post or comment on a student post (take that, MySpace fear mongers). Teachers can leave online feedback for students to improve their writing (like if they want to get it published) that is hidden from public view. Next, it's free (thanks to David W's generosity). It also has a very active list on Yahoo! Groups for sharing and problem solving. Last, I have never, in 25 years of teaching, seen a more powerful classroom tool for motivating students to write. Nothing else even comes close. It is the perfect blogging tool for teachers. Despite this glowing endorsement, I had reservations, mostly revolving around my first impressions of the visual appeal of the website (as shallow as that may seem!). It seemed to lack the clean, user-friendly look of 21classes and Edublogs. Nevertheless, from what I'd read I believed it was definitely worth my best shot. Because a school code is needed before establishing a blog I had to email the creator, David Warlick, and request a code. This arrived in two days and I was then able to set up the main class blog, as well as each student's blog, assigning them a password which only they and I would know. As it says on the Classblogmeister homepage, there are over 700,000 blogmeister blogs, and so it's unsurprising that there is a considerable amount of information and support available out there. I spent a fair bit of time searching for this, and was able to find a number of useful links that helped me in my planning, which I have bookmarked on Delicious. There is also a Classblogmeister Ning, with a lot of video tutorials, links and forums. Throughout the project if ever I had a question or problem, I found that it was answered on this Ning within a few hours. That level of support has got to be a key factor in deciding on Classblogmeister. I see it as a clear advantage to use a platform that is purpose built, has a feedback tool built in to the process, and has a large edublogging community around it already.